Party chief Syed Munawa­r Hassan encour­ages voters to make inform­ed choice­s. 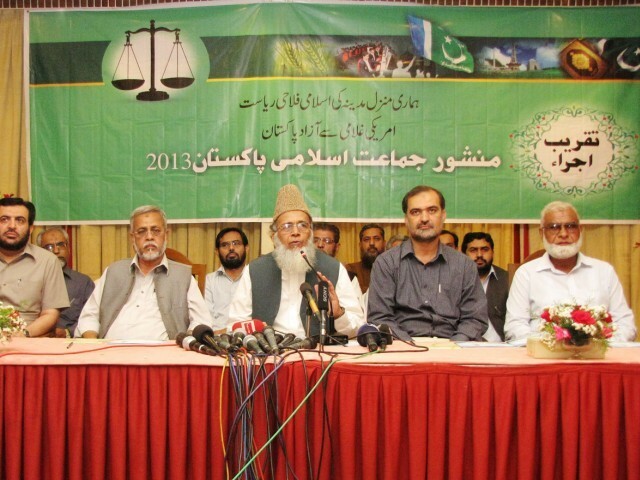 KARACHI: The Jamaat-e-Islami (JI) has announced its manifesto for the upcoming general elections. The document comprises several ambitious goals, including wiping out terrorism, lawlessness, unemployment, energy crises and the unequal distribution of wealth. One of the main points in JI’s manifesto is that the party will strive to eliminate corruption and free the national exchequer from plunderers. 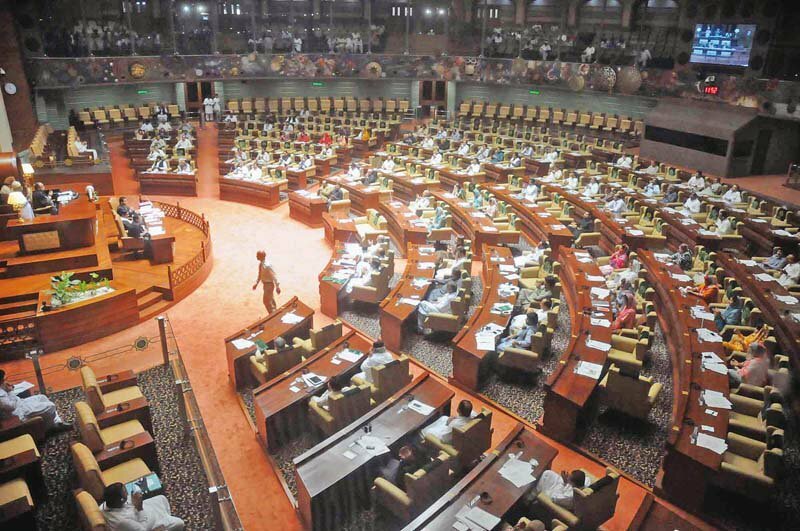 “Corruption is the root cause of all problems,” said Hassan, “An honest government can only provide a corruption-free society.” He added that JI has the cleanest track record – in the past over 1,000 people have been elected from different platforms so far but nobody has blamed them for corruption. Commenting on the situation in Balochistan, the JI chief said cases of kidnapping for ransom had been increasing daily in the province but the people living there put up with the problems instead of revolting violently against their plight. While replying to a question, the JI chief said, “The government should have accepted Taliban’s offer of negotiation but they turned it down just because of pressure [from abroad]. We should try to win back Taliban, they are our people.” Hassan said terrorism has increased since the war on terror began in the region, adding that only terror has increased and war hasn’t brought about any favourable results. Published in The Express Tribune, April 16th, 2013. Says time for seat adjustment with other groups is over. Most small parties, have survived since they were accommodated by bigger parties. Mainstream parties sign declaration on implementing reforms. Corruption is not the biggest problem. It is more rampant in countries like Japan, South Korea and even India as compared to Pakistan. Independent judiciary is enough to root out corruption that is why every year the Prime Minister or Finance Minister of these countries is sent home. The biggest problem is ECONOMY which is declining every year with record-high Budget deficit of 8%, fragile condition of Current Account deficit, highest unemploymentent with no place for over 4 million young people joining the working age every year but find no employment opportunity. The second biggest problem is ENERGY when people in different cities suffer from 18 to 20 hours of loadshedding, the reserves of gas are depleting fast with no major discovery during the last 10 years. The military dictatorship of Musharraf and then his NRO-beneficiary PPP has miserably failed in paying any attention to energy crisis. Factories are shutting down and millions of workers are being laid off causing further woes to the fragile economy and create law & order crisis. The third biggest problem is EDUCATION since Pakistan has one of the lowest literacy rates in the world. The uneducated people cannot find an employment opportunity and therefore fall prey to the extremist organisations which use these people for their nefarious designs. We need to put our priorities right if we are serious about improving the condition of 185million Pakistanis. So that you sadly manipulate and use Islam to get elected again. And Taliban must be your people they are not Ours. No true Muslim in Tribal Areas support Taliban only you do. Taliban have killed and terrorised OUR innocent people in the tribal areas. JI has no competent and able people to manage the economy or the run country. They only know how to run their mouths.